This short story is about a Siamese cat who lived with a scientist, J.H. Hetherington, a professor at Michigan State University. I am not sure of the year but it was before the personal computer, so sometime before about 1980. Actually, I have just discovered that it was 1975. The good professor had written a long and complex article for publication in Physical Review Letters and he needed to proof read it. Unfortunately he had used the editorial "we" rather than "I". As he was the sole author of the article he was told to change this. That presented a lot of work to Professor Hetherington as it meant retyping the whole thing. He was unable to use the "find and replace" function of a PC as they didn't exist at that time. He clearly didn't fancy retyping the whole thing so he invented a co-author. This seemed like a neat solution. He decided to name the fictional co-author F.D.C. Willard. F.D.C stood for Felis Domesticus Chester. It was the dressed up name of his Siamese cat. Why not? Siamese cats are known to be one of the most intelligent cat breeds. All went according to plan. The research article was well received. F.D.C Willard instantly became a world renowned scientist! But Professor Hetherington went a step too far and became a bit ambitious. He decided in 1980 to present another paper, but this time under his cat's sole name. This couldn't last, as you can no doubt imagine. When the professor was out and a visitor asked to meet F.D.C. Willard instead, the intelligent Siamese cat was exposed! Siamese cats are in the top bracket of cat breed intelligence - it is said. It is very difficult to test the intelligence of cats! For a start they have different skills to humans. And there is the question of whether cat breeders selectively breed for intelligence. They don't. They breed for appearance and secondarily for character. So why should Siamese cats be more intelligent than the average cat? They aren't is the sensible answer but I don't want to spoil the idea that Siamese cats are intelligent. I am indebted to Sam Stall who wrote: 100 Cats Who Changed Civilisation: History's Most Influential Felines. THIS PAGE WAS FIRST PUBLISHED ON PoC IN AROUND 2010. 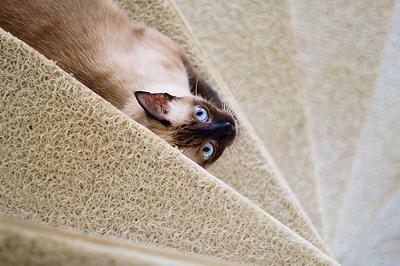 This entry was posted in Uncategorized and tagged cat intelligence, siamese cat, Siamese Cat Breeders, siamese cats by Michael Broad. Bookmark the permalink.